Some might call the Imperial City the jewel of the land of Cyrodiil. Seated in the middle of majestic Lake Rumare, the ring-shaped city is dominated by the image of the imposing White Gold Tower, which looms high above places like the Arboretum, Waterfront, and Arcane University. It's almost like you could walk right in to the imperial grounds and speak with the Chancellor, the new head of state after the untimely death of Emperor Uriel Septim VII. But you can't, because this wouldn't be Oblivion. This would be in Minecraft. To be specific, this would be a full-scale model of Oblivion's Imperial City, recreated in indie sensation Minecraft - and unlike many of the other (deservedly celebrated) projects that Minecraft-ize things like the floating city of Columbia or the Starship Enterprise, its creators are building it the old-fashioned way: mining it out, brick by brick. "What makes this project unique to others, is that we're building it in Survival Multiplayer," virtual architect Lionheart_1 told The Escapist. To Minecraft laypeople, this means the builders have to do everything by hand, rather than use level editors or specially designed programs as shortcuts. "Every block will have to be carefully placed (or carved out of the ground), with the added complications of gathering the materials needed and avoiding the havoc that mobs bring." So while volunteers can come help out or admire the team's handiwork, this also means that the project is "constantly running the risk of griefers or creepers getting too nosy and setting us back during construction," explains co-creator Lathania. With all the risk and necessary effort involved, why tackle a monumental project like Oblivion's Imperial City it in the first place? "My previous project was a rather large cathedral that had its own technical difficulties, such as trying to construct vaulted roofs. So, by the time it was nearing completion, I was looking for a completely new challenge," says Lionheart. 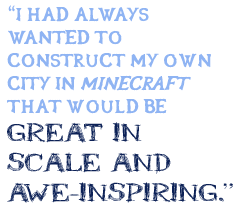 "I had always wanted to construct my own city in Minecraft that would be great in scale and awe-inspiring, so I began scouring my brain for cities that I could either draw elements from, or re-create. The Imperial City fit both criteria. Besides, I'd love to call the city 'home.'" "I had spent so many hours immersed in Oblivion, with its lush environments, extensive lore and grandeur, that when I was trying to think of a new project, it immediately came to mind for inspiration. That both games shared a common bond in terms of, 'This is the world, go out and have fun,' just made it a logical choice as well," he says. The announcement of The Elder Scrolls V: Skyrim several weeks after work had started on the project provided further impetus to get things done.